Sermon for Reformation Sunday: "Free"
Is it a day to wear red and play pin the 95 theses on the door? Well, no. Though festive ways of remembering the Reformation are good. Is it a day to pat ourselves on the back for all our good works these past 498 years? No. Luther teaches us that the church abides in the Word of God, not the works of man. Is it a day for church spring cleaning: burn some books, remove all crucifixes, and stick out our tongues at the pope and declare our liberation from the papacy, right? No, not at all. Remember, Luther didn’t set out to start a new church; but to reform the church. To bring the church back to abiding in the Word of God. Luther taught Christian freedom, not anarchy. Now, there was a radical reformation. They huffed and puffed and tried to blow the whole house down. They wanted revolution. Luther wanted reformation. 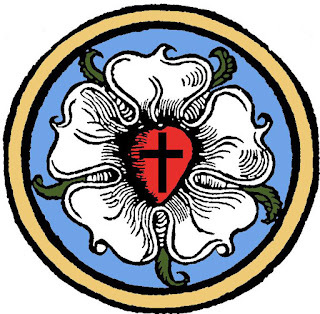 This is why Luther kept, and Lutherans to this day still keep and treasure the practices and ceremonies of the church, things like chanting, vestments, processions, singing hymns, using the liturgy, stained glass windows, and other works of sacred art. These things point us to Christ when taught and used rightly. For we hold that one is justified by faith apart from works of the law. It doesn’t get much clearer than that. There’s the heart of the Reformation. And the heart of the Christian faith. You, a sinner, are justified, saved by Christ’s death on the cross, apart from the works of the law. Free gift. By grace you are saved. You live by Christ’s mercy, not your merits. Now that sounds like a reason to celebrate. But there’s more. God’s Word is an eternal gospel, proclaiming that all nations are saved by the Lamb who was slain and lives. God’s Word declares that you are justified by faith apart from works of the Law. God’s Word sets you free from slavery to sin. Everything is founded on God’s Word. Our Faith in Christ is born of the Word. Faith is fed by the Word. Faith is sustained by the Word. And Apart from Christ the Vine you, his branches, wither and die. A little historical amnesia. As they stood and talked with Jesus, the Romans occupied Israel. And don’t forget the Persians, Assyrians, Babylonians, and that “little” extended stay in Egypt. How soon they forgot. How soon we forget. As bad as the Egyptians were, there is a worse master: Sin and Death. The truth is, we’re all slaves to sin, just as Israel held captive in Egypt. Everyone who commits sin is a slave to sin. Whether you’re a son of Abraham or Luther, it doesn’t matter. We’re born in captivity. And it’s not just our thoughts, words, and deeds. No, it’s much deeper than that. Capital “S” Sin. We’re stuck. We’re enslaved. And we’re powerless to liberate ourselves. Any attempt at self-emancipation only make matters worse. It didn’t work for Luther. It won’t work for us either. But don’t forget to read the next verse. Commit it to memory. And are justified by his grace as a gift, through the redemption that is in Christ Jesus. It’s true. We’re terrible, horrible, no good, very bad sinners. But it’s also true that God took our terrible, horrible, no good, very bad sin and placed it all upon His holy, perfect, innocent, and righteous Son Jesus. The Son joined us in our humanity. Jesus stood side by side with the slave to free us. Jesus paid for your rescue with his own precious blood. Jesus entered our captivity to rescue us. Jesus was bound in death’s chains to bring you life and freedom. Jesus’ death and resurrection is the end of your slavery to sin. Luther rediscovered this good news: Jesus was not a righteous judge, but was judged in our place. Jesus came to bestow God’s undeserved grace upon us, not to be an example of earning God’s grace. Jesus sets you free…from the Law’s condemnation. Free from slavery to Sin. Free from death. Free to stand before God as a justified sinner. And you’re free to serve your neighbor in love. And today, Luther’s joy is our joy. For the Son became a slave so that the slave might become the son. God’s eternal inheritance is yours. You belong to him. And you have a seat at the table. Come, receive the Passover supper of our Lord’s body and blood. You are forgiven. You are free. And if Jesus sets you free, you are free indeed.